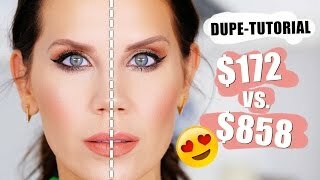 I honestly don't get the tendency or need, in so many such videos, to put on SO much base/foundation? If you have good or great skin, why so much foundation? It does not help, and in fact makes you look more made-up...it hides the natural beauty of your skin...you look more artificial/high maintenance, etc. Anyway, I agree that the two sides of her makeup looks are equally great. The only thing I might consider re: drugstore vs high-end however is... the actual ingredients in the various products, and how those may impact your skin over the long-term (i.e., are some of the products intended to go on your overall face (i.e., blush, powder, foundation) loaded with chemicals vs plant-based ...artificial colors vs. natural colors derived from plants, etc. *XRYTHELP* THE VERY BEST BRreporterCHANNEL HELP THERE IS TOTALLY FREE SUBSCRIBE !!! I feel guilty because I immediately guessed from the thumbnail which side was which :( I don’t know why guilty, but there it is... Also, I have literally never broken a spookiest off of a brow wiz 😂 I laughed so hard the first time I saw one of yours broken, but now that I realize it’s a whole thing I’m just confused about what torture you put yours through!